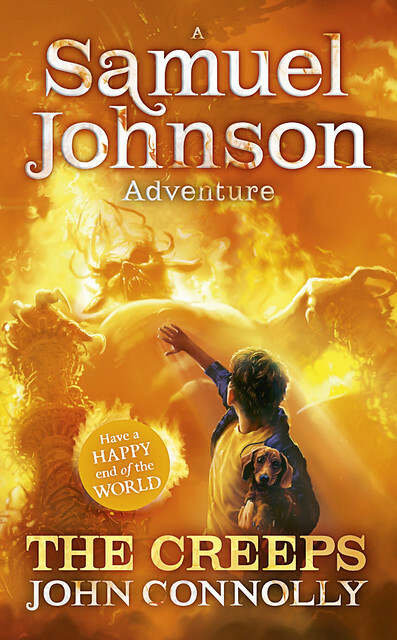 Samuel Johnson must be one of the most wonderful boy heroes in fiction! I love him. I’m not alone in this, because there is a fair amount of love in this last (I wish it wasn’t) book in the trilogy by John Connolly, although it is also about one of the worst dates in history. Mrs Abernathy is back, if only in bits and pieces. That woman certainly knows how to hold a grudge! After so much exciting stuff taking place in Hell and other far-flung settings, it almost comes as a surprise to spend most of this book in the somewhat unusual town of Biddlecombe. I like second and third books. That’s when you know what’s what and you and the supporting characters have learned to find your way around. Even the stupid policemen have stopped being quite so idiotic, and have the good sense to know when they are up against the devil and generally supernatural things. The same goes for the – almost – loveable dwarfs. You know where you are. Biddlecombe. You know Mrs Abernathy is bad, even in molecule form. I’m a little concerned that the scientists sent to Biddlecombe from CERN in Switzerland are nearly more stupid than the policemen, but you can’t have everything. It’s not only the molecular Mrs A you need to worry about. Teddybears and armed dolls are not toys. (Think Ilya Kuryakin and the dolls…) Beer can damage your health, and who cares if your best friend is a little green? As with the first two, The Creep is a very funny book. John’s footnote style asides are most entertaining, and should go a long way to educating young readers. But along with that lovely humour you do get the serious aspects of life, love and friendship. Courage. I need more books like these. They are what makes life worth living. I admit it. I have hung on to more ABCs than strictly necessary. So many of them are truly lovely, in various ways. And here is another one. 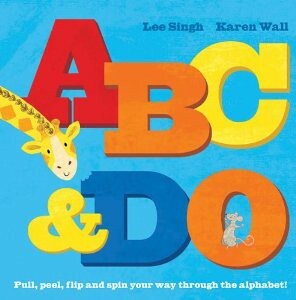 As it says on the cover of ABC & DO you can ‘pull, peel, flip and spin your way through the alphabet.’ There is no storyline here, however short. This is an ABC. But it is an ABC with lots of fun moveable bits. How long the book will survive is another matter, but you and your small person will have fun while it lasts, as you pull and flip and all those other things. There aren’t as many pages as there are letters in the alphabet, because Lee Singh and Karen Wall have cleverly combined some letters into the same picture, so sometimes you can have several actions on one page. The adult will – hopefully – know that you can’t go directly from L to N. There must be an M somewhere, and there is. I know. Once your small person(s) have learned the alphabet there is little reason to keep too many ABCs. But they are fun. 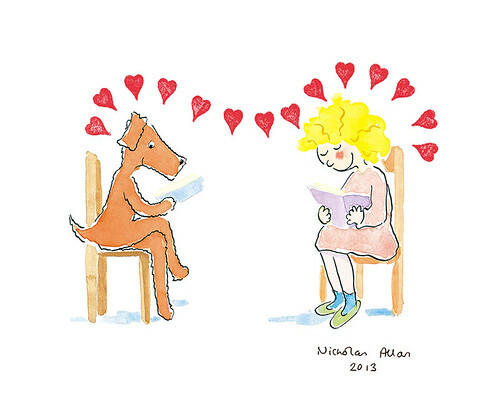 Here are Babette and Bill (who in the book are girl and dog, respectively) and they love each other very much. They do everything together. But one day Babette lags behind and eventually drops out of everything they do. And nothing Bill tries will help. One day Bill is alone, because Babette has gone to hospital. This is a children’s story about heart disease, so there is a happy ending. But it makes you think. Sold in aid of International Children’s Heart Foundation, both Nicholas Allan who wrote the story, and Helen Bower from Hodder Children’s Books have had experience of heart surgery. There’s nothing wrong with some bricks and a few planks. Not in the slightest. It was good enough when the Resident IT Consultant and I were young. Because we were. Once. 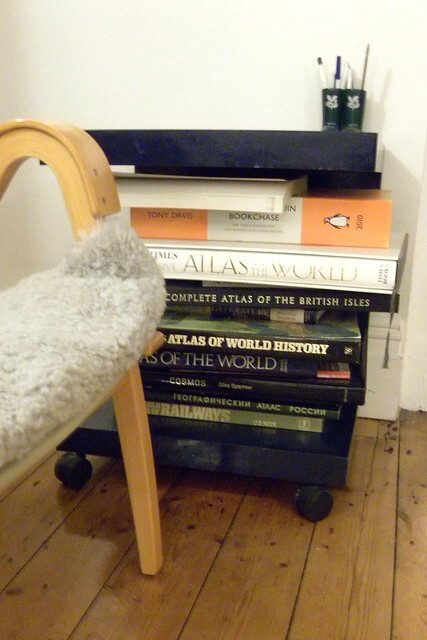 I remembered this easy way of furnishing a room and storing your books at the same time when Daughter’s room needed something of specific dimensions a couple of years ago. But bricks were beneath her. It had to be proper furniture. Where’s her sense of adventure? You’re only young once. That much I have discovered. You can more or less have your shelves tailored to exact measurements. Height, depth, width. Perfect. But oh no. What’s a lot harder are those atlases. It’s really lovely to have a truly large atlas. Or five. Ten, even. Because it’s a luxury to be able to see the world on a larger page. But it’s hell shelving that world once you’ve had your look. If anyone has any suggestions we’d be most grateful. Currently we are storing them underneath one of the bedside tables (Lack) we use for putting coffee mugs on next to our armchairs. It’s not ideal, but works better than other things we’ve tried. One solution would be not to have a lot of atlases. I’m not sure how well that idea would be received. Daughter has come to the conclusion she needs bookshelves in her student room. Trouble is, they don’t allow any unofficial furniture. In which case you’d think that expensive halls would come with something to put books on. Books are sort of part of the education that brought the student there in the first place. We might get something for her to use, ‘on the quiet.’ It needs to be small and easily collapsible at the end of the year, when you either drag all the stuff back home, or put it into storage. In either case, you can’t turn up with a Billy under your arm. I’m thinking it has to be the smallest Ivar, who (see, I think of it as a him!) can be pulled apart again. It really would be a lot easier with bricks and planks. For the aficionado Hilary McKay barely needs an introduction. Not everyone is as slow or as stupid as I was some years ago, thinking Hilary was just your ordinary girls’ books author. She is anything but, and my ways have been truly mended. I still have a few of her, mostly junior, books to read, which makes me very happy. Because reading Hilary’s books makes me happy. It was very kind of her to come to Bookwitch Towers to subject herself to an interview. She wants the minimum of fuss, so isn’t an obvious interview subject, really. But I was very glad she came, and that she could put up with it all. This book could have been made with me in mind! 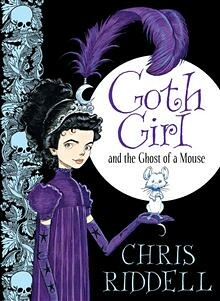 Chris Riddell has written and illustrated Goth Girl and the Ghost of a Mouse, and as you might be able to guess, the cover is of a goth girl, and a mouse (who unfortunately happens to be dead), and it’s all black and velvety with silver skulls, and the girl wears purple and the page edges are a shiny purple and there is a ribbon bookmark. So Ada wanders around the big house all on her own, until she finds some children (the way you do, in your own home) that she can be friends with. She gets a new governess. Again. Maltravers the butler is not a very nice person, nor is the cook Mrs Beat’em. The house and the grounds are full of unusual creatures, and hidden gardens and what have you. The annual indoor hunt is about to take place, and this time things look decidedly fishy. In a way this is your average gothic tale (which is no bad thing), but the adult reader, at least, will recognise the people and places, and the things, which Chris has put in his book, only slightly disguised. You get ‘all’ the classics in one fell swoop, and the whole book is full of Chris’s beautiful illustrations. It is very charming, and all ends well. I was worried at first about the governess, but as long as there is no garlic she will be fine. And Ada’s new friends are good friends. 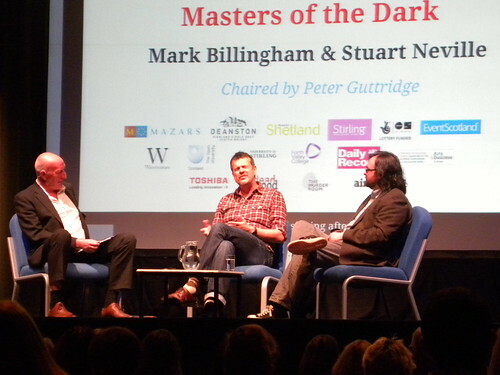 Masters of the dark they may well be, but Mark Billingham and Stuart Neville are also a lot of fun. 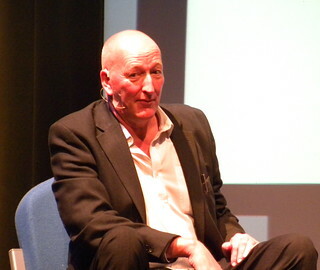 With the help of Peter Guttridge as chair, Bloody Scotland offered a marvellous morning of entertainment, well worth braving a dark and stormy Stirling at noon. You could ask yourself ‘who goes out to a literary event in weather like that?’ and the reply would be, ‘quite a few, actually, including Arne Dahl’ who presumably needed to check out the competition. Peter was back to his usual sparkling self, and we could have gone on forever. We only got an hour, but it was a good kind of hour. I knew nothing about Mark before, and emerged rather fond of this writer who is brave enough to go out with uniforms, just to see what it’s like at ‘the sharp end.’ Fun, until reality calls, when it gets pretty grim. In the police car it’s mostly filth and farting. The two policewomen who gave Mark the guided tour suggested putting his DI Thorne back in uniform, which you can do, apparently. They keep their rank, but discover that the bad treatment dished out to uniforms rubs off on them as well. A lower rank non-uniform policeman will talk down to someone in uniform even if they outrank them. Truth is stranger than fiction. There was some unmentionable stuff featuring cats, pigs and horses. The horse and crime scenes tape story was ‘fun’ though, and I wouldn’t have minded seeing that policeman going over the fence. Stuart’s new book Ratlines is a standalone which has received heaps of praise. It is about Ireland’s history with the nazis. Set in the 1960s, it features Hitler’s favourite commando, Colonel Otto Skorzeny. 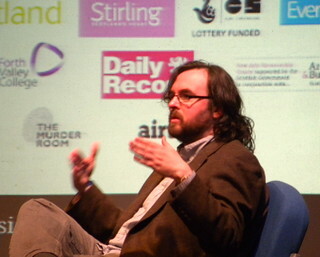 It was a break for Stuart, who wanted to write the story before someone else did. He says ‘you couldn’t make Skorzeny up.’ He lived publicly as a minor celebrity, as well as being an acquaintance of Charles Haughey. Stuart did some research on life in the 1960s, which included finding out you can’t dress a woman in an off-the-shoulder dress. It would have been scandalous. You have accuracy versus authenticity, and it’s the feel of truth that you want, rather than truth itself. Strangely enough, Stuart had been criticised for having been unfair to the nazis. He said that the Skorzeny/Haughey set-up made things larger than life, and he had to prevent things from becoming too cartoonish. 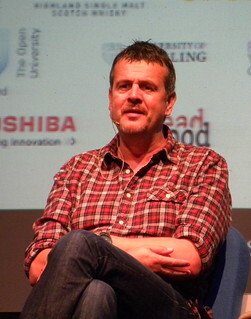 With old age – as opposed to old, old age – Mark has found he doesn’t care for violence, and much prefers the effect of a single drop of blood. He has discovered, much to his surprise, that he enjoys the ‘window moments’ when a character is resting, instead of charging around in action scenes. Detectives need plenty of depth; the reader should get to know what troubles them away from the crime solving. Stuart has a female detective discovering she has breast cancer, for instance. You can have too much of a good twist. Mark has dubbed them ‘Chubby Checkers’ where they twist, and twist again. And you shouldn’t keep hinting thoughout a book. You know something, you share it. And he definitely doesn’t believe in characters that take over and tell the author what to do. Despite hatemail and abuse on Twitter, Mark feels ‘the time comes when you have to kill a character.’ Absolutely. And Stuart likes ‘rooting for the killer.’ That’s not character-killer Mark, btw. I think he meant fictional killers. I’ve already lost track of where paranormal noir came into the picture – I didn’t even know there is such a thing – and poor Stuart reads very little these days. That’s the problem with babies.